8mm Forum: Digitize Sound from 8MM? » 8mm Forum » 8mm Forum » Digitize Sound from 8MM? Author Topic: Digitize Sound from 8MM? Anyone know a good way of transferring the sound off an 8MM/Super 8 with Sound? I am thinking of using a wolverine to transfer the image, then clean in post, but some reels have sound too. I'm happy to transfer the sound seperately and sync in post, but don't know a good way to get the cleanest possible sound. Thanks! Hi Joe and welcome. 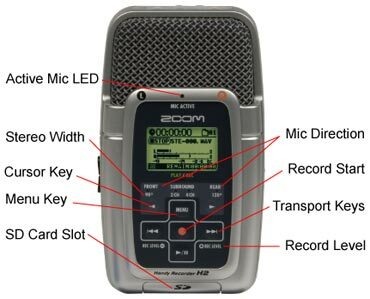 There are several ways you can record the sound. Just connect the sound output from your projector to a recording device. This could be your computer...a camcorder...or I use a digital sound recorder. I just recently recorded audio off 2 super 8mm 400 ft sound reels for a forum member in my area. I used the Aux out from my Yashica Sound P-810 projector connected to my Zoom H2 digital recorder. The Quality was excellent. With this recorder I can record the mono output to both left and right channels. I could have also done this with software in post...but nice to do it in realtime. The audio synced up very well with the telecine capture. However there are times when editing may be required for a perfect sync. I usually use Adobe Audition to clean up any hum or hissing...but you can use the free Audacity for this also. I prefer hooking the projector directly to my pc,using any freeware audio recorder of your choice. With this approach you can have more precise control during recording to get maximum possible audio level without overloading. But the REAL FUN PART is when aligning the audio with the scanned pics during editing. Should keep you busy for a while. Thank you both SO much! I have an audio recorder, so perfect. But I actually don't have a projector and was planning to digitize with Wolverine, so sounds like I need a projector. Any thoughts on a quality projector that can play 8mm, Super 8 and has sound output? Thank you! 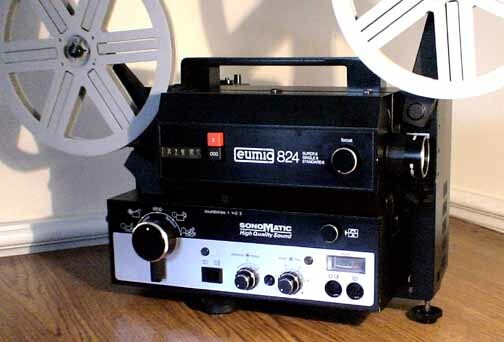 The Eumig Sonomatic 824 is probably the best dual guage sound projector. 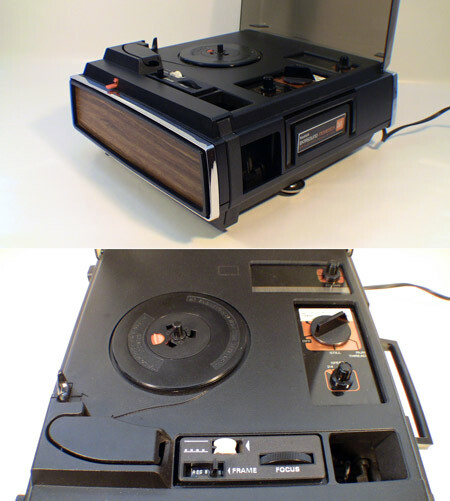 It can play or record both 8mm and super 8mm sound. Speed can be adjusted from 18fps to 24 fps. The Eumig 810D is also a good choice if you need a dual sound projector and they are a little more available and less cost than the 824. These two Eumigs need to manually exchange the guides and gate to switch formats and they can have some audio hum. 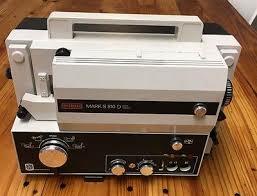 However...if you still want a dual format machine, but only need sound for Super 8 films you might look for a Kodak MovieDeck 265, 285, or Supermatic 20. These are not your typical projectors...but very convenient. They hold up to a 400ft reel and easily change formats by moving a switch. They have an audio output 1/4" jack that you can attach an 1/8" adapter to plug into your computer or digital recorder. I have two of these projectors that I have used for audio transfers in the past. The MovieDecks have a nice pull out viewing screen in addition to projecting to a screen. 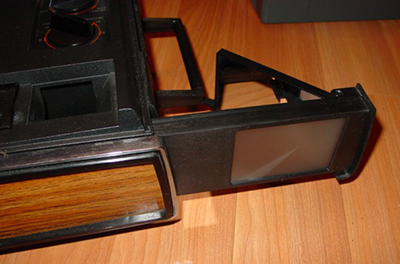 You could also buy two separate projectors one for Super 8 sound and another for regular 8mm silent films. Hi Joe. I have been transferring films for three or four years now using a Eumig 810. I have recently done twenty five films belonging to my old uncle. Unusually, these were 'sound' films which was a bit of a head scratcher initially. However, I simply connected the line out from the 810 to my laptop and captured the audio in the free 'Audacity' programme. It was incredibly simple! The quality of the audio was out of this world compared to how we usually hear it, with a wheezy old clapped out thing (the projector- not my uncle!! ).He was thrilled with the result. Best of all was that one of the films had my grandparents talking. We hadn't heard their voices for thirty years and a lot of tears were shed when I played the final film. Just a word of warning if you buy a projector; make sure the machine has a 'line out' otherwise it will be useless. My 903 Eumig doesn't seem to have one so be careful in choosing. That's great John - I have my eye out for a Eumig 810D (as Janice recommended). I see it has a speaker out port - is that what you used? What kind of connector did you need to go from the camera to your laptop? Thank you!! Hi Joe....I have not transferred any sound from my Eumig 810D, but if I were I would use the front Line-out socket ... not the speaker output. All you would need is a 5-pin din to 1/8" plug adapter cable. You could plug the 1/8" plug into a recorder or directly into the computer line-in socket. Something you have to be careful of, especially with the Eumig 800 series is ground loops. The hum performance with these is not the best (usually good enough), but when you connect them to another grounded device it can get downright awful! A big part of the problem is the main transformer is pretty well grounded, but there isn't any ground wire directly to the frame of the machine. That connection is through the mounting screws. What you can do to improve this is take (at least) one of the transformer mounting screws out and slip a star washer under it and tighten it down snugly. You should also plug your computer into the same outlet as the projector. I have pretty decent ground loop rejection with my sound system yet a few weeks ago my Eumig 800 actually succeeded in overwhelming it and putting a buzz In my speakers. I measured the voltage between the Eumig chassis and good ground and saw almost a volt! I put in some star washers, measured it again, and the voltage dropped down to .03 Volts. The buzz hasn't been back ever since. If you connect everything up and this happens to you, please just remember this post. You may get even a good one and not have the problem too, it's just a problem of variability. -and while I'm at it, the Eumig 800s are by and large very good machines, you just need to work with small issues like this and you'll do just fine! Hi Joe, yes the set up was exactly as described by Janice above, using the line out rather than the speaker port. Janice was also absolutely correct with the various connectors she described. I have added a very short video to YouTube this morning titled 'Eumig 810 audio capability test' in which I have put together a few clips to demonstrate the sound I captured using this method. I was surprised by how well it came out and my Grandad's Blackburn, Lancashire accent is captured in all its glory! Hi people, I'm not sure if this is the best place to write this; I was about to open a thread for this but I see you seem to be experts on Eumig s810d. I got one of these real cheap some weeks ago from a flea market, I thought the lens was broken but it was simply out of place and it turned to be in a very good condition - after cleaning its internals, it was intact on the inside and even the bulb was working! Unfortunately, after 10 minutes of playing or so, a big "pop" sound made appearance and sound disappeared from then. I examined the mechanism and noticed a fuse was burned - replaced it and the new one immediately got fused too after turning on. So it's clear that something is broken on the sound PCB. Do you have any recommendation on what to check for on these boards? Any common faulty component? Is this defect common on these machines? Is it easy to repair? I could attach some picture but at first sight I don't seem to spot any abvious exploded or burned component, other than the recurrent fuse. The problem with troubleshooting by swapping parts is sometimes failed parts are the cause, and sometimes they're the effect. If you swap a good board into a machine that damages boards, you will wind up with two bad boards. My guess on this one would be some semiconductor device on the board: the input rectifier, a power transistor, some voltage regulator. The problem is there are usually a lot of devices connected in parallel and one being shorted makes them all look shorted. -a guy I used to work with said "apply power and fix whatever blows up!" I can't imagine there would be any difference at all Joe. I would guess that any 7 or 8 series Eumig would give the same sound quality. Thanks a lots for your tips, Steve. Haven't tried yet, but will do for sure. I was tempted on doing the board swapping thing; thankfully I avoided the temptation!